While we can probably all agree that eating out of a vending machine isn’t the healthiest approach, vending can play a role in the solution to health problems associated with overindulgence by offering healthy choices in reasonably sized portions. Traditionally, vending machines aren’t the best source for nutritious snacks. Fit Pick helps you choose products that taste great AND support a healthier lifestyle. 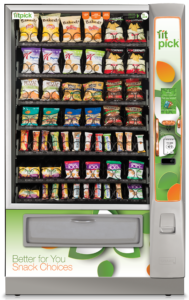 Fit Pick is a program that identifies vending machine items that are lower in fat, saturated fat and sugar. Products that meet specific nutrition criteria are identified with a colorful Fit Pick sticker so they are easy to spot. Fit Pick uses the nutrition criteria known as “35-10-35” in which qualified products have less than 35% of calories from fat, less than 10% of calories from saturated fat, and less than 35% total weight from sugar (nuts, seeds, and dried fruit excluded). Identify an employee as the coordinator responsible for implementing and maintaining the program. Contact Healthy Shasta at 229-8456 or email clievense@co.shasta.ca.us. 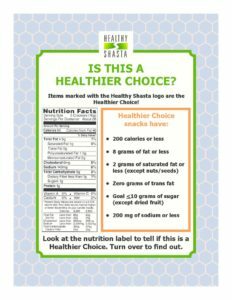 Healthy Shasta staff will provide a Fit Pick Toolkit, technical assistance and work with your vending coordinator (to promote and implement the program). Does your school, business or organization have beverage vending machines? If so, it’s likely they are stocked with sugary drinks which can lead to obesity, tooth decay and some types of cancer. Healthy Shasta is working with local partners to increase the number of healthy beverage options available in vending machines. If you’re interested in increasing access to healthy beverages for your staff, ask your vendor about these healthier options and follow the Rethink Your Drink tips below.